blog) challenge to write a letter every week for 52 weeks I thought I would join in. Pip has set herself the target of writing 52 hellos (starting in January) and has invited everyone else to join in to. She started the project as a way of motivating herself to write more letters, improve her handwriting, be more mindful and take more time out to make special hellos to others. In addition to her own letter writing she will also profile letters that she receives herself on her blog, so is requesting mail to be sent to her. If you are interested in sending Pip a letter she is very open to getting a variety of mail which can include a letter sharing memories, news, a poem, photos or drawings. All you need to do to join in is either write 52 hellos in 2015 and/or write a letter to Pip. More information on the '52 Hellos' project as well as the address to send a letter to Pip can be found over on her blog in the 52 Hellos post. This will be my first letter of the 52 hellos above. 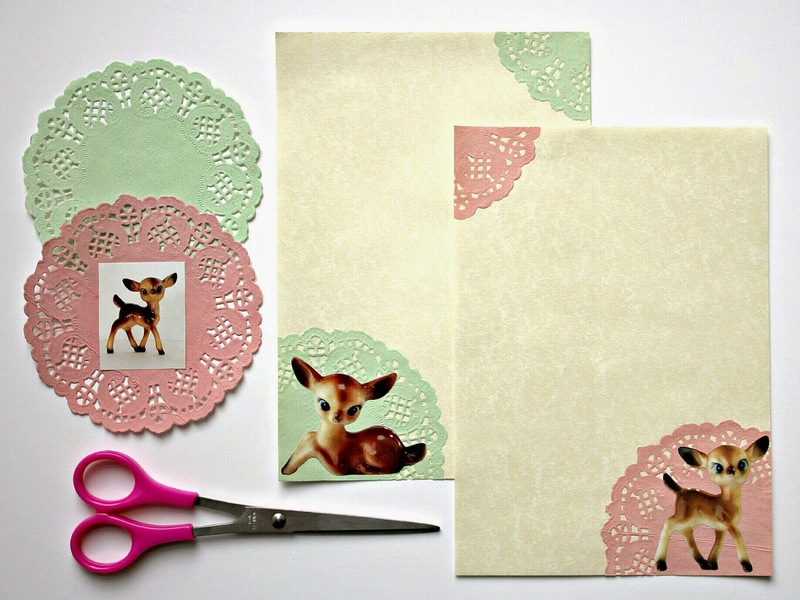 I decorated my writing paper with dollies and photos of deer figurines that I cut out of magazines. I plan on sharing most of my 52 hellos on Instagram (the hashtag for Pip's project is #52hellos) and some here to.